When a central business district building in Erina, on NSW’s Central Coast, needed some nurturing, the owners decided to turn their commercial headquarters into a chic retail hub. Their first port of call for the iconic Platinum Building’s make-over was well known flooring and wall specialist, Honestone. S J Skipper & Associates chairman of body corporate of the Platinum Building, Steve Skipper, said they were very happy with the results. The reputable corporate group said they would opt for the Honestone profile any time. Honestone stripped the existing Terrazzo flooring throughout the 645 metre square area on three levels, over two buildings. 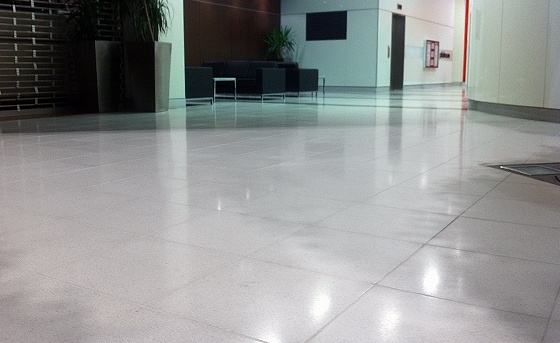 Once the terrazzo had been restored, Honestone used diamond polished pads and treated the floors with a high performance impregnating sealer from Aqua Mix. So too, Honestone was integral in the revamping of City Link Plaza in Morriset St, Queanbeyan. The project was instigated after the plaza’s representative, Doug Chown, was shown the reputable skill-base and expertise Honestone could demonstrate, to revive yet another 650 square metre retail hub. Mr Hendriks said Honestone representatives were requested to visit site to demonstrate the wall and flooring specialist’s ability to rejuvenate the existing mall terrazzo flooring. “The mall flooring was in terrible neglect after years and years of mismanagement,” Mr Hendriks said. “I believe the property had ‘then been’ recently been purchased by Trinity Funds Management, and they were remodelling the entire mall to improve its vacancy rates. Doug had been appointed as the on-site property manager and who we met for our site sample. Within four hours we had demonstrated to Doug sufficiently our capability with stunning results. As soon as Doug had our proposal approval from Trinity, we were down there for stage 1. The overnight transformation was simply amazing. Mr Hendriks said Honestone had fitting materials for a plethora of environments including the commercial industry, just like the Platinum Building and City Link Plaza, the hospitality industry, manufacturing, and commercial spaces, offices, architectural residential projects, and many more. He said the company had fitting experience with rejuvenating old worn flooring as well as utilising new materials on existing surfaces. To find out about how Honestone can enhance your space, why not contact us today?